Books Written By EAHAE Members And Friends. Order by clicking the book cover! Horse trainer is a horse which was given the ability to influence people. To influence the way people think and live. Agata Wiatrowska has been conducting development programmes with horses for years. In this space horses reveal their long-known abilities: their extraordinary sensitivity to communication and the slightest changes in approach, ability to forgive, to balance energy or contact. Agata Wiatrowska introduced this method to Polish public in 2006 and since then she continues to discover secrets of mentors based all around the world: Karin and Gerhard Krebs from Germany, David Harris from United Kingdom, June Guenter from USA, Jackie and Herb Stevennson from USA, Klaus Ferdinand Hempfling from Denmark. She directed programmes in tens of different places in Poland as well as around the world with help of hundreds of horses. She co-creates European Association of Horse Assisted Education and the HorseDream chain. .
During first years of work, her programmes would go through constant transformations related to understanding her own thoughts but also related to understanding the exact role of horses in development. This book is a collection of her experiences. 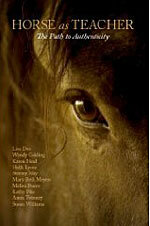 "In first chapters I introduce readers to the role of horses and what does being a horse trainer exactly mean. 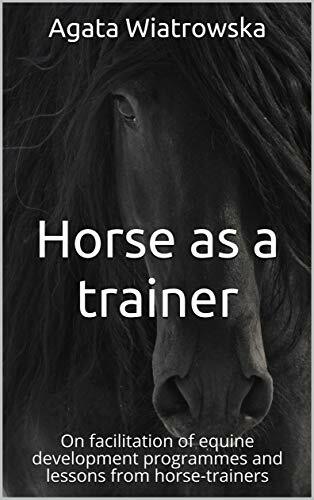 Next chapters take the reader on a journey of seeking the contact with yourself through contact with a horse and describe lessons from horse-trainers experienced by previous participants. The last part describes the role of a facilitator who creates development space for people in which horses are trainers. Jude Jennison’s leadership lessons show great empathy and creativity. Her ideas are fresh – and they work.' - Julia Hobsbawm, OBE 'A thoroughly engaging, human and insightful book and definitely one for now!' - Gina Lodge, CEO, Academy of Executive Coaching 'An uncertain landscape has become the one certainty for business and good leadership has become even more important. This book is for all those who want to ensure they can lead their organisations through these challenging times.' - Ian O’Donnell, MBE The rapid advancement of technology has fuelled fast-paced change in business, creating a high-performance culture that requires leaders to be resilient, agile and results-focused. 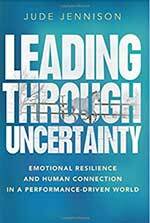 But the increased level of uncertainty and an ever-expanding workload often create stress, overwhelm, fear and polarization, leading to disconnection. The world never stops, and when people get caught in the same trap they risk burning out. In Leading Through Uncertainty, leadership expert Jude Jennison explores the challenges leaders face as human beings in a technological world, the new habits and behaviours they need to adopt to re-connect on a human to human basis, and the leadership qualities they need to lead through uncertainty. This is a call to return to the core of humanity to find the natural human characteristics of communication, connection, compassion and community, drawing on the experience of working with a herd of horses to understand the impact of non-verbal communication on leadership. Leadership is tricky. Nothing is constant. Things change from day to day and moment to moment. Often, the best “tool” we have is a combination of our intention, based partly on the wisdom of our experience, and pure gut instincts. In my near 30 years as a corporate facilitator and leadership development coach and consultant, I’ve found the most effective leaders are those who can look deep inside themselves for their own “truths,” and then courageously express those truths to colleagues, clients, and employees. But that’s not easy, and many of us could use some help. I found my path to leadership through horses. 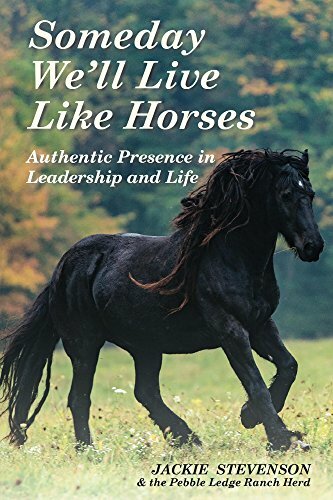 Someday We’ll Live Like Horses: Authentic Presence in Leadership and Life, is inspired by horses and nature and is an invitation to take your own journey into your authentic presence. Our authentic presence is already within us, it is about owning it, and about showing up in life fully and truthfully. Opening to the unexpected and to every day miracles we can shift our perspective of reality beyond what we expect and move to a reality far beyond what we believe is possible. Finding our herd, following our unique path of purpose we have the capacity to do remarkable things and live a remarkable life. Join the adventure of living with authentic presence. Horsepower for you. Starke Impulse für Ihre Persönlichkeit. Schweiz 2017. Pferdeunterstützte Coachings bieten ein "unverdächtiges", spielerisches Umfeld, in dem Teilnehmer durch die Feedbacks der Pferde und die qualifizierten Hinweise der menschlichen Trainer starke Impulse für ihre Führungs- und Persönlichkeitsentwicklung erhalten. Während in der herkömmlichen Weiterbildung meist die Ratio im Vordergrund steht, machen die Teilnehmer in den Übungen mit den Pferden sehr emotionale Lernerfahrungen mit allen Sinnen. Aus den erlebten Situationen bleiben Bilder im Kopf verankert, die für die nachhaltige Umsetzung der neuen Einsichten eine bedeutende Rolle spielen. Cet ouvrage est adresse a toutes personnes intriguees ou touchees par le stress post traumatique de combat. Son role est d'informer sur cet etat et de l'aide que peut y apporter la mediation equine. This book is adressed to any personnes interested or affected by a combat post traumatic stress disorder. 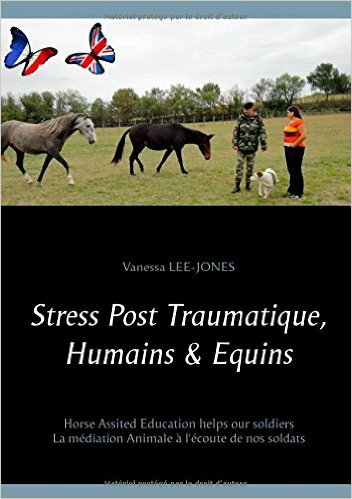 It's role is to informe on combat PTSD and on the help horse assisted education can bring. Your Horsepower by Annemieken Van Reepingen is a richly illustrated and well-substantiated account about and for people who strive to attain personal growth and happiness. Sometimes we lose our way because of what happens to us in our life or because of the increasingly busy and demanding world around us. Is burnout just around the corner? Here you will find answers and strategies to firmly maintain your own unique course towards freedom, success and happiness. The horse, coined the most noble of animals with good reason, has a perfect sense for what goes on inside us and holds up a mirror to our innermost feelings. Horses guide us along our path towards healing, recovery and help us to regain our self-belief, enabling us to once more appreciate all the possibilities every new day can offer. The moving stories in this book are a witness to this fascinating journey. Each of Berenika Bratny’s breathtaking pictures is a tribute to the horse and beautifully illustrates the remarkable experiences described in this book. Your Horsepower is an honest and positive book and a great read, even for those readers who feel they are not in need of help at all. To take a road trip to Success, we will need a destination as well as a GPS. Success is described here as the achievement of a goal. The goals we adopt may be the result of experience, vision or desire. They crystallize our desire to get to a better place. Having picked a goal for success, how do you get there? What drives you on? Some more popular goals include amassing wealth, gaining recognition and a desire to improve the lifestyle of others. It is also interesting to note that both philosophers as well as successful travellers on this road to success tell us that the journey is the real prize, not merely arriving at the destination. So what route does your roadmap follow? 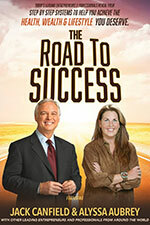 Whatever route you choose, the CelebrityExperts(R) in this book can mentor your trip. They have completed this trip before, and they know where the potholes and the dead-ends are. These successful people have traits in common including creativity, risk taking, planning, perseverance and they are action-takers. Without taking action, The Road To Success is merely a mirage. So read, learn and enjoy. Safe travels! Are you a conscious business owner or team member searching for a new way to do business; wanting a framework to help you develop your leadership skills; frustrated by all the time, energy and money wasted every day? If you answered yes to any of these questions, then you need to read The Alchemy Of Change. 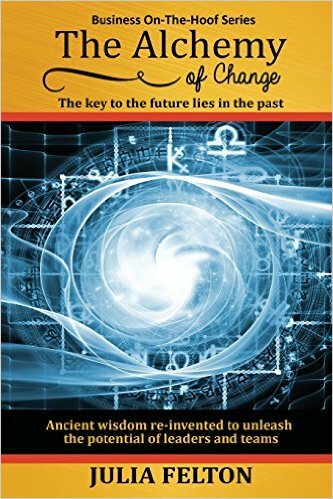 In this powerful, insightful and thought provoking book, Julia Felton draws on her 20+ years of corporate and business experience to share the Joined Up Business Blueprint™, a methodology for creating a new breed of business – one that is sustainable and consciously aware of how it impacts society. A blueprint destined to become the standard for the new age. Co-founder and director of The Leadership Whisperers, Jude has helped senior leaders develop embodied leadership skills that create a significant impact in business. Through live events and workshops, clients partner with horses who provide non-judgmental feedback, enabling them to identify their strengths and weaknesses and transform themselves into courageous and hugely influential non-verbal communicators. Jude's corporate clients report significant results including resolving conflict, cultural change, improving financial performance, increasing sales and individuals gaining promotions. In 2011, Jude overcame her fear of horses and in doing so, she discovered a way of learning that gets fast results and enables leaders to be more courageous and compassionate in the workplace. In six months, she had trained in Equine Guided Leadership Development, qualified at a globally accredited standard and obtained her first horse, despite not knowing how to keep one. Frequently described as courageous and inspirational, Jude Jennison is an author, international speaker, leadership coach and Horse Assisted Educator. Prior to running her business, Jude had a successful 16 year senior leadership career in a large global IT organisation, where she led UK, European and global teams. Ksiazka opisuje doswiadczenia z programów rozwojowych z konmi (Horse Assisted Education), w których - w ciagu ostatnich 10 lat - wzieli udzial menedzerowie z kilkuset polskich i zagranicznych firm najrózniejszych branz. Inspiracja do powstania kazdego rozdzialu byly doswiadczenia uczestników programów prowadzonych przez autorki oraz dyskusje po cwiczeniach, które czesto dotykaly spraw waznych i fundamentalnych dla zdrowego i satysfakcjonujacego zycia zawodowego. Z tego powodu ksiazka moze okazac sie wartosciowa nie tylko dla tytulowych menedzerów i osób pracujacych w organizacjach, ale tez wszystkich zainteresowanych wlasnym rozwojem, rozwojem innych osób oraz innowacyjnymi metodami uczenia sie. 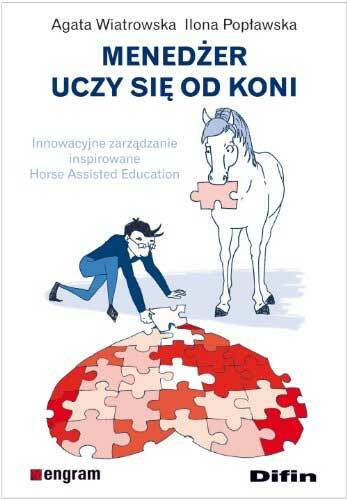 Horse Assisted Education to metoda zaskakujaca, której esencja jest uczenie sie poprzez doswiadczanie i eksperymentowanie, a efekty, jakie przynosi uczenie sie od koni, wykraczaja czesto poza stworzone do tej pory modele teoretyczne. 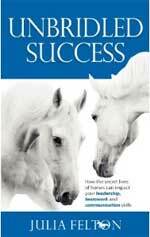 In Unbridled Success Julia Felton shares the profound life and business lessons that horses have taught her. 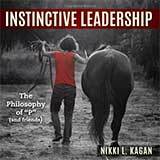 Through her candid story telling she provides insights into how horses can help us become more self-aware and connected to ourselves and others. The result is improved leadership skills, both of ourself and others, as she reveals that leadership is an earned position based on trust and respect. 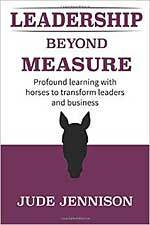 This provides a refreshing departure from the idea that leaders are always the dominant one.Unbridled Success also clearly reveals that Horse Assisted Coaching is not just some fad, but a really profound way for both individuals and teams to engage in experiential "full body" learning. Learning that will never be forgotten and that has a systemic change on individuals and organisations. At a time when training budgets are under pressure investing in innovative programmes that deliver demonstrable and measurable change is a cost effective alternative to traditional classroom learning. The book challenges us to leave our comfort zone and try something new so that we can expand and develop and see things from a new perspective. What lessons will you learn from a horse today? All the skills needed to transform your life and business relationships. 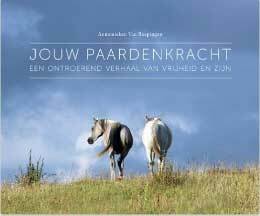 In diesem Geschenkband kommen 25 Persönlichkeiten aus der Pferdewelt zu Wort. In ganz persönlichen Anekdoten erlauben die Autoren einen Blick hinter die Kulissen. Sie erzählen, was sie über Pferde, aber auch über sich selbst, gelernt haben. Darunter befinden sich Namen wie Ingrid Klimke, Christoph Hess, Klaus Balkenhol, Markus Fuchs, Ann-Kathrin Linsenhoff oder Georg Wahl. Der Leser erhält viele Anregungen, wie er sein Pferd zum vertrauensvollen Mitmachen motivieren kann. "Reiten als Lebensschule" wird durch die Lebensphilosophien der Autoren eindrücklich illustriert. Das regt an, selbst in den Spiegel des eigenen Pferdes zu schauen. Katharina Wimmer, Wien 2009: Führungsstile und Führungsverhalten. Eine Überprüfung am praktischen Beispiel pferdegestützter Führungsseminare nach dem HorseDream Konzept. 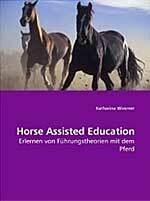 Katharina Wimmer: Horse Assisted Education. Jeder kann heilen lernen. Jeder kann seinem Pferd zu mehr Gesundheit und Wohlbefinden verhelfen - und zwar mit seiner eigenen Heilenergie. Wie das Heilen mit den Händen funktioniert und was auch Ungeübte mit Hilfe dieser uralten Heilkunst bewirken können, vermittelt Margrit Coates ganz praktisch und gleichzeitig bewegend: Der Weg ins Innere des Pferdes. Wie Sie eine Heilbehandlung geben. Heilen mit Chakren. Fallgeschichten. Margrit Coates ist Englands bekannteste Tierheilerin und Autorin vieler Bücher. Schon als Kind entdeckte sie ihre besondere Begabung, doch erst als Erwachsene wurde sie Tierheilerin - zum Wohl der Pferde. Heute bietet Margrit Coates auch in Deutschland regelmäßig Kurse für Heilpraktiker und Tierbesitzer an. How to share healing messages with the horses in your life. A top animal healer reveals how to share healing messages with the horses in your life. Following the success of Healing for Horses, Margrit Coates explains how to interact with equines on a deep level. She gives practical advice on how to tune into your horse and understand what it is trying to communicate to you about well-being. She shows how to sense what a horse is feeling and when it is healthy or suffering. You will also learn how to exchange healing messages, soul to soul, with your horse in order to strengthen the bond between you. 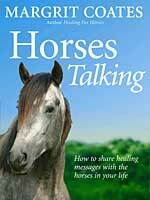 Included are many fascinating case histories of horses and those who care for them, showing how they have mutually benefited by learning to open the channels of communication. Intended for every horse owner, rider and handler — and the many thousands of people who work with horses including vets, complementary therapists, grooms, stable hands, trainers, instructors and breeders. 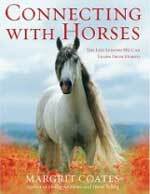 This book is for anyone who loves horses. Horse Assisted Education. Pferde im Managementtraining. Adventures in Awareness: Learning with the Help of Horses. HorseSense for the Leader Within. Are you leading your life, or is it leading you? Bloomington, Indiana, USA 2004. HorseSense oder wie Alexander der Große erst ein Pferd und dann ein Weltreich eroberte. Drei Schritte zum Charisma der Führung. Wien, Austria, 2003. 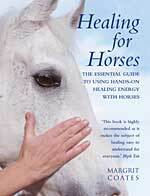 This text explains what healing means, how it works and how it can work in the context of animals. Margrit Coates provides practical guidance on learning the skill, when and where to do it, along with the do's and don'ts. She explains what chakras are, how energy runs through a living being, and how healing can be a benefit. There are many case histories included, histories of horses who have been sick, depresses, injured or terminally ill, and how healing has helped them. 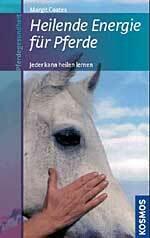 This book is intended for those who work with horses or around them, orthose who just have an interest in horses. Erfahrungen in das berufliche und persönliche Leben. 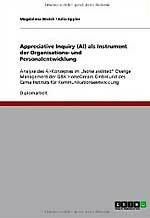 Master Thesis zur Erlangung des akademischen Grades Master of Arts im Universitätslehrgang Bildungsmanagement eingereicht von Mag. Katharina Vollmann, Zentrum für Bildungsmanagement und Hochschulentwicklung, Department für Weiterbildungsforschung und Bildungsmanagement an der Donau-Universität Krems, Betreuer: Univ.-Prof. Dr. Stephan Laske, Wien 2014. Das Pferd - eine sinnvolle Ressource im Mentoring-Prozess? Horse Assisted Education as a Development Tool for Leadership Communication Skills. 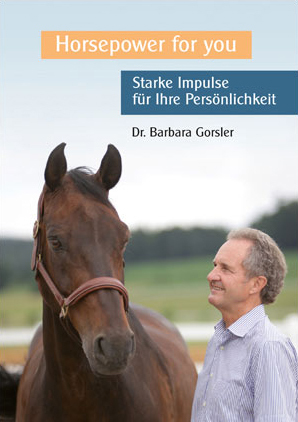 Abschlussbericht zum Lehrgang "Trainer für Horse Assisted Education"
Eine qualitative Transferevaluation am Beispiel "Die Pferdeakademie"
Kommunikation als Schlüssel für erfolgreiches Führungsverhalten. 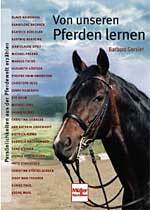 Was Menschen von Pferden lernen können. Kritische Darstellung von Zielen und Vorgehensweisen. The horse as a trainer. Leadership Training, using horses as a media. Britta Binnewies: Die Bedeutung, Entwicklung und Steuerung von Teamprozessen durch die Anwendung von Teamtrainings am Beispiel des Unternehmens G&K HorseDream GmbH durch Teamentwicklungstrainings mit Pferden als Co-Trainer. Hamburg 2003. Überprüfung eines Seminarkonzeptes mit Pferden.